Roland P. Young was a huge advocate of underground music, culture, politics and radio, DJing in the Bay Area in the 1960's and 70's before creating the amazing Isophonic Boogie Woogie LP in 1980. Here, an entire realm of free sound gets channeled through Young's mind into what can best be described as "afro-minimal-free-electronic-drone music" (according to the site of Em, the Japanese label that just reissued this). It's a stunning statement indeed, with Young crafting his out sound with kalimba, sax, clarinet, bells, electronics and assorted other instruments, all flowing in their own space to amazing result. Like Larry Young's Lawrence of Newark, Philip Cohran's On the Beach or Love Cry Want's live 72 record, this is a highly cosmic sound experience rooted in the earth itself. You can find this CD here or here, and for now check out "Velvet Dream" (MP3). The Android Sisters were played in heavy rotation by several FMU djs back in the day. S'cool. dug this record up in the jazz section of WUOG in Athens, Georgia a year ago. just could not ignore that cover. what a great slice of weird psychedelic jazz! 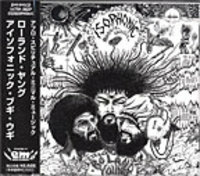 Roland Young was also involved in Infinite Sound, an ultra obscure free/spiritual jazz group that released (to my knowledge) only one self-titled LP in the early 70s. Excellent album.